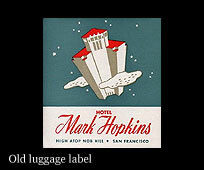 When The Mark Hopkins Hotel opened on December 4, 1926, San Franciscans proclaimed it "architecturally perfect, flawless in its erection, comprehensive in its accommodations...strikingly representative of the best there is in modern hostelry"
Located at California and Mason Street, the InterContinental Mark Hopkins San Francisco stands at the crest of Nob Hill, several hundred feet above San Francisco's downtown business and shopping district. The 19-story hotel's architecture is a combination of French chateau and Spanish Renaissance, embellished with elaborate terracotta ornament. Because the hotel consists of a tall central tower and two wings outstretched like arms, the rooms offer spectacular views of the San Francisco Bay, the city, the surrounding hills and the ocean. Such a splendid hotel is only fitting for this historic and commanding site. When Robert Louis Stevenson visited San Francisco in 1879, he declared, "Nob Hill, the Hill of Palaces, must certainly be counted the best part of San Francisco. It is here that millionaires gathered together, vying with each other in display". Of these homes on Nob Hill built by such magnates as Stanford, Crocker, and Huntington, none was grander than the gabled Victorian mansion of Mark Hopkins, a founder of the Central Pacific Railroad. Hopkins' wife, Mary, was given free reign in the mansion's design which included: a built-in pipe organ, oak paneling inlaid with ebony, and several-story-tall entry hall/art gallery. Mark Hopkins died just before completion of the grandiose structure. In 1878 his widow moved into the multi-turreted $3 million Gothic castle built entirely of redwood. 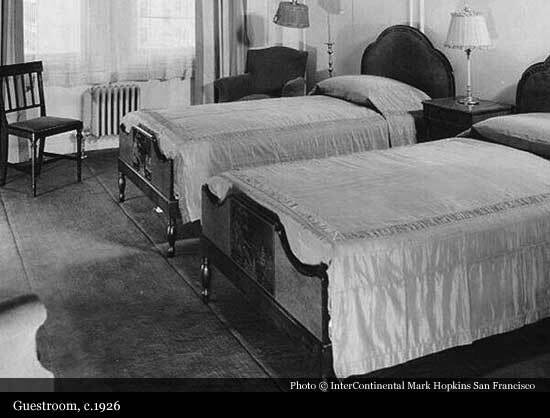 Several years later, Mary Hopkins moved to the East Cost and married Edward Searles, her interior designer and junior by 30 years. After Mary Hopkins death in 1891, Edward Searles donated the long-unoccupied Nob Hill mansion to the San Francisco Art Association, which converted the building into classrooms, studios, and galleries. The mansion burned in the fire, which followed the 1906 earthquake, and only the hillside property's mammoth granite retaining wall remained standing afterwards. Later, it was learned a huge water reservoir existed beneath the structure. Less than one year after the 1906 earthquake conflagration, the Art Association erected a temporary wooden building on the foundation of the Mark Hopkins mansion. But other San Franciscans saw a far grander use for this remarkable location. One night in 1910, mining engineer George D. Smith and a friend were strolling past the modest Art Association building when he said, "Someday, I'm going to build a hotel there." 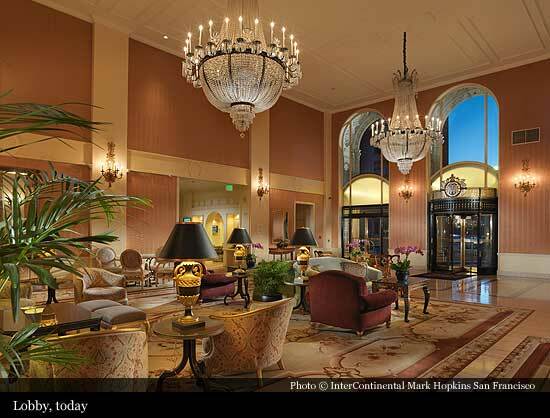 At once, the hotel became a leading social center of San Francisco. In the 1920's, 1930's and 1940's, the glamorous Peacock Court hosted such memorable dance bands as Benny Goodman, Tommy Dorsey, Anson "Dancin' -with-Anson" Weeks, Xavier Cugat, plus the era's top supper club entertainers like Betty Grable, Dorothy Lamour, Rudy Valley, Hildegarde, Dorothy "The Broadway Hillbilly" Shay, and exotic Peruvian songbird Yma Sumac. The banquet rooms were filled with debutante balls, wedding receptions, and glittering dinners, sometimes served on the hotel's 24 -carat gold dinner service. The Mark Hopkins' guests included US. Presidents, statesman, international royalty, and Hollywood celebrities. Twenties and thirties film idol John Barrymore was a frequent guest. His pet monkey, Clementine, was less welcome at the hotel after she climbed the curtains in Barrymore's suite, shredding the brocade as she went. 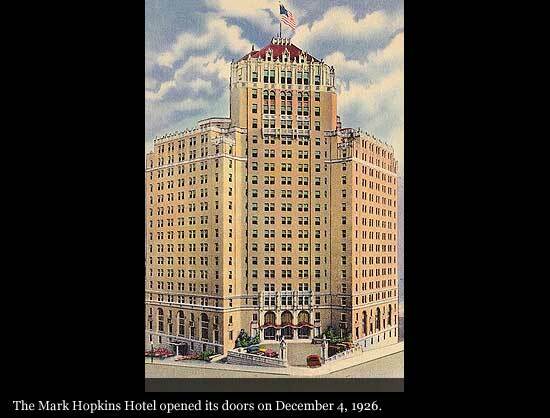 In 1939 hotel owner George D. Smith created a sensation at The Mark Hopkins Hotel when he converted the 11-room penthouse on the hotel's 19th floor into a glass-walled cocktail lounge featuring a 360-degree view of San Francisco. This became known as the Top of The Mark. Although Smith later told friends he wasn't sure that people would ride an elevator 19 stories just to enjoy a drink and the view, the Top Of The Mark was an immediate hit after it opened on May 11, 1939. That year, San Franciscans and visitors alike flocked there to view the twinkling lights of the Golden Gate Bridge International Exposition on Treasure Island. 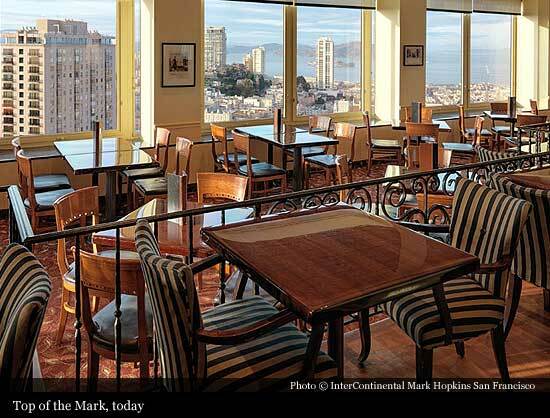 During the Second World War, The Top of the Mark was a favorite spot for Pacific-bound servicemen to enjoy their last liberty before shipping out. As the ships left the Golden Gate, anxious wives and sweethearts often gathered in the Northwest corner to watch the departure, earning that section the nickname, "Weepers' Corner". When the servicemen returned to San Francisco, they often came back to the Top Of The Mark and asked the bartender for their unit's "squadron bottle'. Once the serviceman signed his name on the label, he could drink from the bottle for free. There was only one catch: the man who took the last drink was required to replace the bottle. But how did the Top of The Mark acquire its distinctive name? According to San Francisco Chronicle columnist, Herb Caen, Smith told friends, "I don't know what to call the top of The Mark." "That's it," they told him. "What's it?" Smith replied. "Top Of the Mark." And that's how the 19th floor lounge got its name. 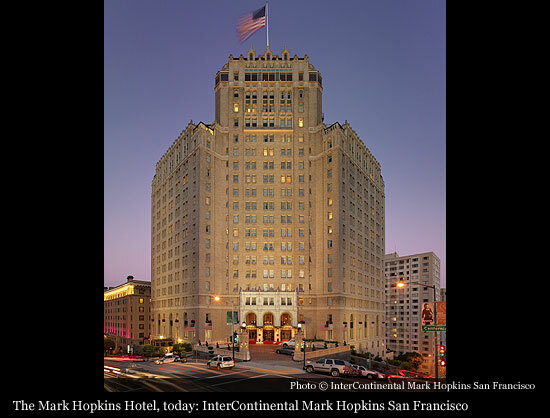 After the Second World War, The Mark Hopkins remained one of San Francisco's most fashionable sites for dancing and supper club entertainment, debutante balls, weddings, and banquets. Its guests included the leading statesmen, royalty, and celebrities such as Herbert Hoover, Dwight Eisenhower, Prince Philip of Great Britain, Queen Juliana of Holland, Emperor Hailie Selassie, ElizabethTaylor, Elvis Presley, Judy Garland, Michael Jackson (who required a personal chef to prepare his vegetarian meals) and The Rolling Stones (who took two entire floors for themselves and their entourage). When General Charles de Gaulle of France entered the hotel during a visit to the United States in the 1960's, he mistook doorman Mark "Smilin' Jack" O'Neil for some sort of American military officer, and he gave him a smart Gaelic salute. O'Neil promptly returned the salute. 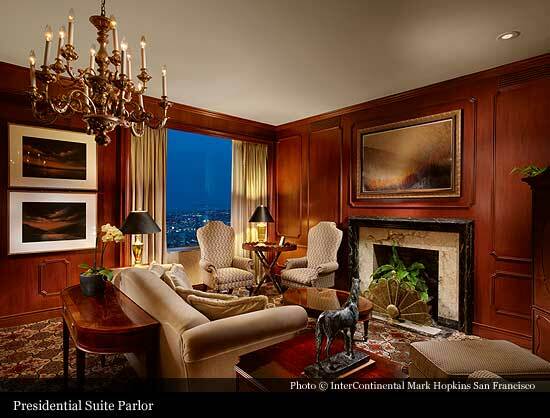 During his 1961 visit to America, Soviet Premier Nikita Khrushchev stayed in the Mark Hopkins' 17th floor Presidential suite. For the duration of his visit, the suite boasted a one-button black telephone with a direct line to The Kremlin and Russian security guards that periodically paced the rooms with Geiger counters looking for any sources of radiation. In 1962 George D. Smith sold The Mark Hopkins to Louis Lurie, San Francisco's "Wizard of Montgomery Street". In 1973, Inter-Continental Hotels Corporation, which owns or manages over 100-luxury hotel on six continents, signed a long-term management contract with Lurie's heirs, who still own the property. 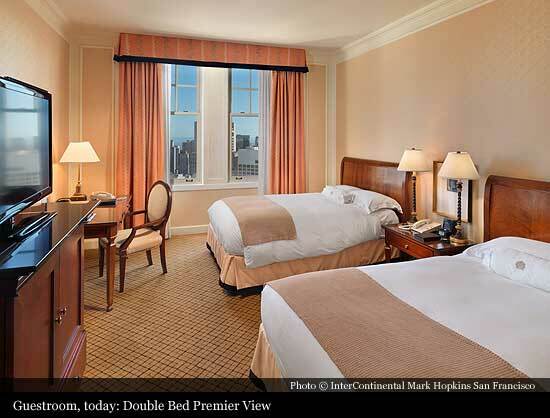 Shortly thereafter, InterContinental Hotels Corporation, which has restored more than 20 landmark hotels worldwide, commenced a painstaking several-year renovation of The Mark Hopkins. This project included the restoration of the landmark facade and its elaborate ornamentation, redecoration of the lobby and all public rooms, redecoration of all guest rooms, and installation or upgrading of all mechanical and safety systems. In 1987, a 10 million renovation gave The Mark a new, fresh look. 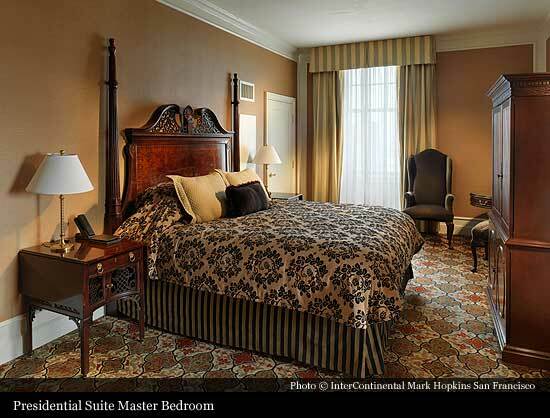 All 391 guestrooms and suites were remodeled in the neoclassic style employing custom designed furnishings and plush fabrics. 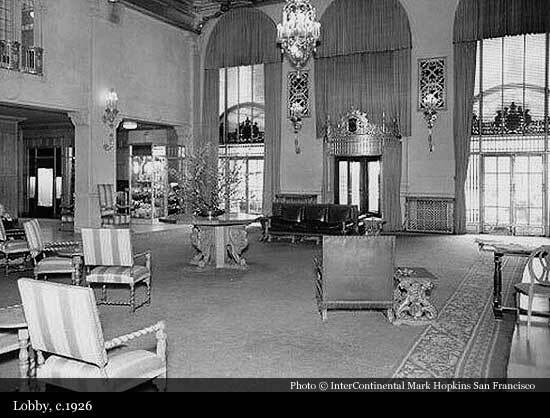 Also included were the Lobby, Lower Bar Lounge, and the Nob Hill Restaurant. 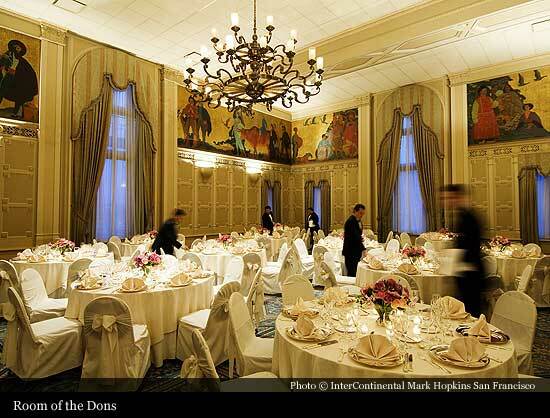 During 1995 the Mark unveils the historic renovation of The Peacock Court and Room of the Dons. Highlighted by a dazzling display of intricate colors and design, the Peacock Court's impressive ceiling holds its esteemed place as the focal point of the ballroom. Inspired by the ceiling, the room has been designed in rich colors of blues and beige with a custom woven carpet that mirrors the exact pattern of the ceiling. The Room of the Dons is indeed a piece of history. On its wall hangs nine, seven-foot high panels painted by California Artists Frank Van Sloun and Maynard Dixon. 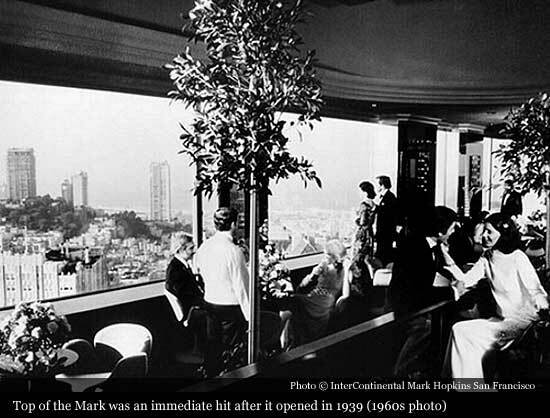 During the summer of 1996, The Mark Hopkins redesigns it's legendary "room with a view", The Top of the Mark. San Francisco's famous sky lounge made its reopening debut in the fall, after a three month, 1.5 million-dollar renovation. The change was significant. The bar, once located as a focal point of the room, has been moved to a corner over looking the Golden Gate Bridge. An elevated mahogany dance floor surrounded by conversational seating, featuring comfortable modern sofas, classic settees, and upholstered chairs with "Bay Area Legends" signature plaques, has replaced this. Alabaster and sculptured metal chandeliers; Italian banisters, beveled mirrors wall and European-style plaster prepare this lounge for the next century. A multi-million dollar restoration was completed in 2002. 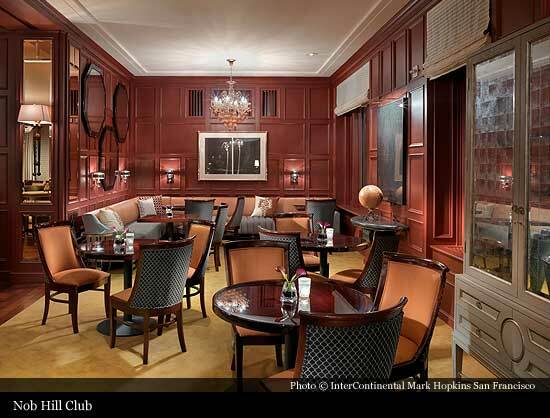 The restorations have enhanced the hotel's original character of old-world luxury and style. 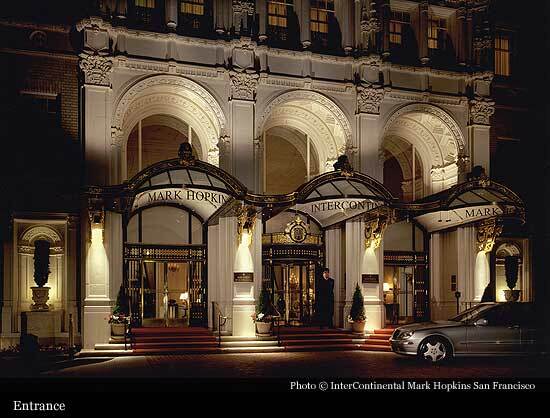 The InterContinental Mark Hopkins continues to represent the best there is in the modern hostelry, as it did on opening day. 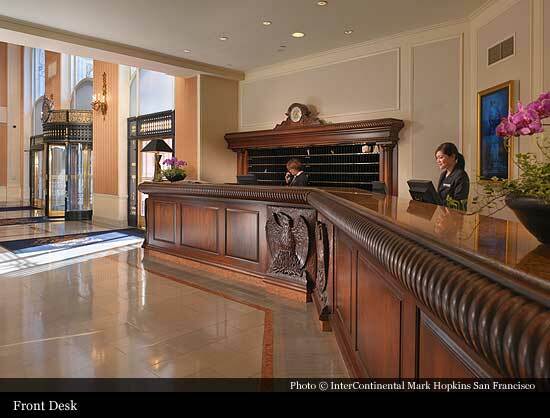 Achieving this excellence was original owner George D. Smith's goal in 1926, and it is the legacy maintained by the InterContinental Mark Hopkins San Francisco today.